in help in healing fish. The Hakko Air Pump 100 will deliver a maximum of 120 Liters Per Minute . Suitable for ponds up to 10,000 gallons. Hakko Air Pumps are sleek in design. This is a cast iron body style. They are small units with a surprisingly high output. Ideal water depths between 2 feet to 12 feet deep. Shut off depth is 16 feet deep. The Hakko air pumps are built to last with a very durable body and mechanics meaning years and years of everlasting quality airflow. 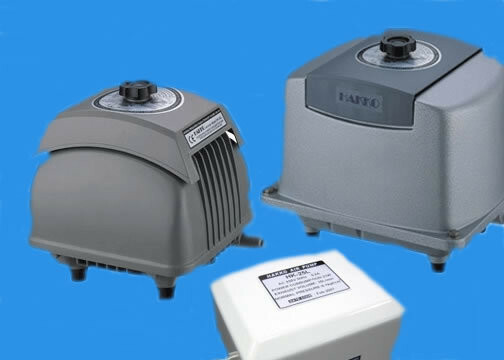 Hakko air pumps utilize linear- motor theorem to reduce power consumption during full operation. Units are extremely quite utilizing spectrum analysis technology in order to decrease any mechanical noise. 110 Volt is standard. 220 volt is by special order. No oil needed for lubrication making the Hakko easy to maintain.